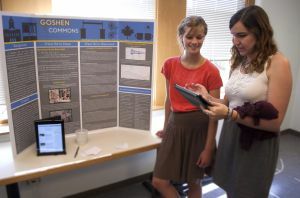 Liz Core, left, and Ariel Ropp, both Goshen College students, presented their research findings about the Goshen Commons website at a poster session in July. 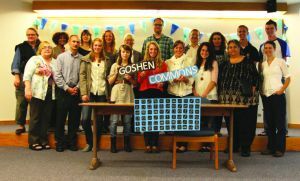 As Goshen Commons, a community news website for the city of Goshen, approaches its first anniversary in September, those involved with the site are both pleased with its success and looking toward a future with an even larger following and better representation of Goshen’s diversity. Goshen Commons, which was started by Duane Stoltzfus, chair of the Goshen College Communication Department, with help from students and faculty in the department, focuses on blogs and feature stories instead of hard news, thus aiming to complement rather than compete with local news sources like The Goshen News and The Elkhart Truth. 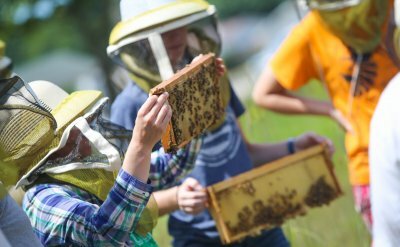 Articles on Goshen Commons are typically positive stories about people and groups in the Goshen area—recent pieces include a feature on two women who cutting out electricity and purchasing only local food to reduce their environmental impact and a Q&A with people who have proposed new building projects along the Mill Race. A group of bloggers writes posts that range from humorous to serious and touch on a wide variety of topics such as farming, movie analysis, bicycling and tales from childhood. The site’s tagline is “where a community meets for conversation,” and, according to Stoltzfus, who serves as executive director of Goshen Commons, the site is a venue that aims to connect Goshen’s diverse population and inform people about those who live nearby. As part of Goshen College’s Maple Scholars program, in which students conduct independent research projects alongside professors, Liz Core ’14 and Ariel Ropp ’13 worked under Stoltzfus’s direction this summer to analyze the site’s success and look for strategies to improve it in upcoming years. 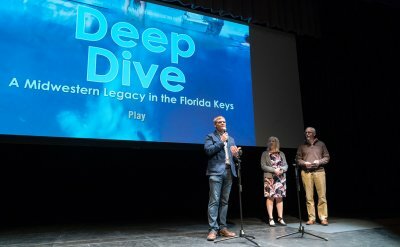 Core and Ropp explained that the work for their project was threefold: It involved interviewing a variety of community members to find out what they would like to see from the site, talking with creators of similar community news sites to get their advice, and assessing site analytics. This project led to many recommendations that Stoltzfus hopes to implement during the upcoming year. One of the key goals is to make the site more representative of the diversity of the Goshen community, both in content and in the writers and bloggers who contribute to the site. Goshen Commons was launched one year ago by the Goshen College communication department. One of the groups that Stoltzfus hopes will be more involved in the future is Goshen’s significant Latino population. Ropp spoke with staff from the Center for International and Intercultural Education at Goshen College to gain ideas about how to better engage and involve Latinos, such as having a collaborative Latino blog where a different Latino community member, writing in either Spanish or English, contributes a post each week, and having a series of stories about Latinos in the Goshen area. Additionally, with the aim of having more of Goshen’s older population involved in the site, Core had a conversation with Greencroft Goshen staff members, which led to the idea of Greencroft resident bloggers and more coverage of residents’ stories. Other suggestions that came from Core and Ropp’s research include increasing community outreach by having a table with Goshen Commons information at First Fridays or the Goshen Farmer’s Market and creating Goshen Commons flyers to post and give out around the city. During the past year, Stoltzfus has also found that intentional use of the site’s Facebook page is a great way to inform people about new content, and aims to continue to use Facebook in this way. In addition, Goshen Commons has recently begun drawing more visitors by delivering content through a new medium: video. In a separate Maple Scholars project, Abby Deaton ’15 worked with Kyle Hufford, general manager of FiveCore Media, a video production company associated with the college’s communication department, to develop feature videos for the Goshen Commons website. 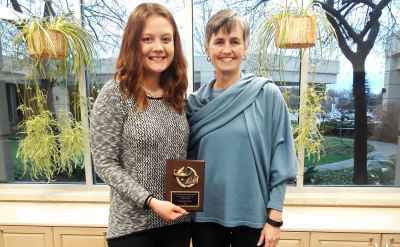 Deaton created five videos, whose topics include homelessness in Goshen, local farming and a sports journalism camp for middle schoolers, each of which is featured on the Goshen Commons website. Deaton’s videos are popular, and she hopes to produce more, perhaps in conjunction with The Correspondent, Goshen College’s biweekly news program, during the upcoming school year. Overall, those involved with Goshen Commons hope that, in the future, a more diverse set of writers and bloggers join the staff, the number of visitors to the site increases and the site continues to be a valuable way for community members to connect. The Goshen Commons staff would be glad to hear from anyone in the Goshen area who would like to participate in the site as a blogger, writer, or in any other capacity. Email info@goshencommons.org if interested or for more information.